INKtastic is one of the newer print on demand websites. This POD is lots of fun, has many interesting products, it is very easy to use. You, the shopper, can customize almost any design by adding whatever text you wish. Just because we can, and because I need something to write about, today we will look at some products and some of my designs on INKtastic. My favorite product comes in several different sizes or categories. You can purchase it in the youth or more men’s sizes (smaller sizes will fit women, as well). And….drum roll… the favorite product of mine is the Stars & Stripes shirt. Here we see it with the “Assembled in the USA using Belgian parts” design for youth. Next we see this on the men’s shirt with the same Stars & Stripes on the sleeves. This design, while made for men, can also be worn by a woman if purchased in the correct size. I hope you’ve enjoyed our little tour of the Stars & Stripes shirt with two of our lovely designs. Hope you have a lot of fun on your next patriotic holiday! Meaning “no” in Greek, oxi can be spelled “ohi” or “ochi”, and pronounced “oy-hee”. Oxi Day celebrates that day in history when Greek Prime Minister, Ioannis Metaxas, said “NO!! !” to Benito Mussolini’s ultimatum to Greece which would have allowed Axis forces to occupy specific Greek territory. That day was October 28, 1940. and it marks Greece’s entering into World War II, as the Greeks really were a bit upset about the thought of being invaded. On October 28, Greeks everywhere celebrate every year. My own grandfather, arriving in the USA in 1912 and long an American citizen in 1940, always celebrated Oxi Day with his friends. It is kind of Cinco de Mayo for the Greeks with baklava and no chirros. Being of Greek ancestry, I do spend a little time creating designs using that particular flag. Here are a few samples, from different shops around the Internet. Many of my flag design shops have an extensive section with Greek designs. Here are links to them. Today, we will look at flag designs for the country of Greece. Oxi Day (aka, “Ohi day” or “Ochi day”) is coming soon, and will arrive on October 28, just like every year, when the Greeks celebrate the day their leader said, “NO!” to Mussolini. We will be looking at Greek flag designs during the next several weeks. 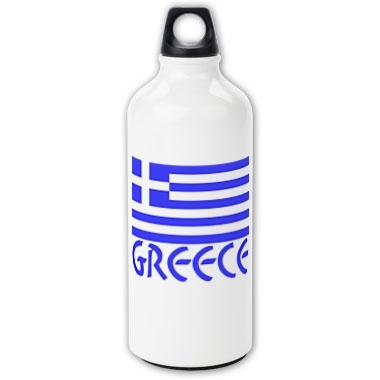 First, we will look at all the places, flagnation.com sells the Greek flag on products, merchandise, apparel, T-shirts, and miscellaneous other stuff. Moving to the shop at ink.flagnation.com, we find everything from toddler clothing to stuffed animals to signs and banners and more. Well, that should do it for today! Happy shopping!